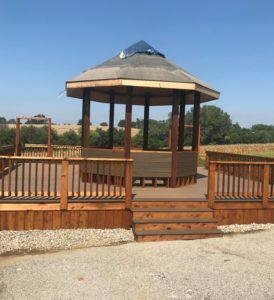 We are done with our part of the deck! 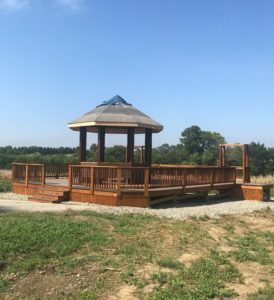 Just talked to the person who is installing the roof and he has just a couple of more things to pull together before he does the install, so a couple of more days waiting on the roof, the the electricial being finished up and the fire pit installed and it will be done! 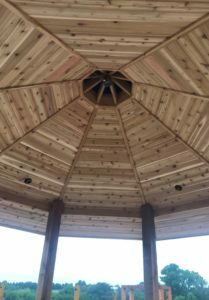 The stain is a dark walnut on everything except for the underside of the gazebo which we clear coated where we just wanted the beauty of the cedar to show. This was a fun job but we wouldn’t have been able to do it without the help of others, so a big THANK YOU!!! to Stein Construction and Handyman Dan. Final Pics once roof, electrical and fire pit are installed!